The synagogue during excavation. The “stone box” is in the center of the Image. Click on Image to Enlarge and/or Download. Reconstruction of the Synagogue with the entrance on the west side. For example, Gurevich notes that the entrance of the synagogue on the west side is a complete reconstruction! He believes that it was on the south side. 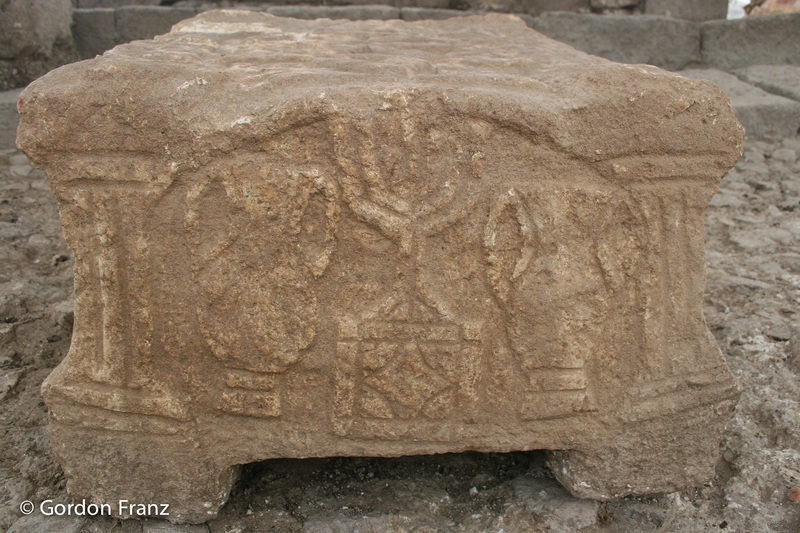 The “Stone” with the Menorah. Click on Image to Enlarge and/or Download. Is it a table for the Torah Scroll? An Incense Altar? A representation of the Second Temple? A Prayer Table? Gurevich’s article discusses all of these possibilities. “Magdala’ Stone of Contention” by Dr. David Gurevich is scholarly, but non–technical. IMHO —a worthwhile 10 to 12 minute read. For 16 photos of the Synagogue Click Here. 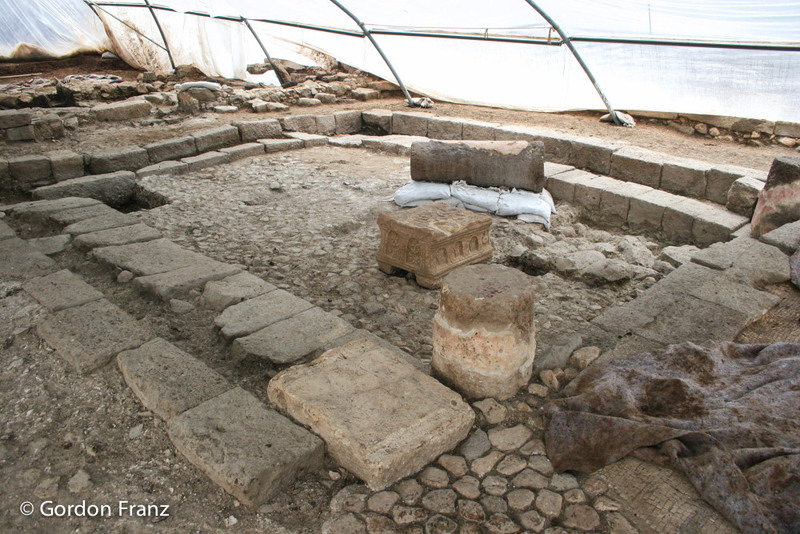 For previous blog posts on Magdala see Synagogue, the Stone, and The Chapel. This entry was posted in Jesus, New Testament, Places in Israel, Synagogues and tagged David Gurevich, Magdala, Rainey, Stone. Bookmark the permalink. Thanks for sharing this. One note about Dr. Gurevich’s article: the issue of the location of the entrance on the south side is the result of studies conducted by myself and Marcela Zapata-Meza (who is cited in the article), recently presented at the 2017 ASOR meeting in Boston. In fact, the citation of Dr. Zapata-Meza is taken directly from the abstract of that paper. More on this will be made available in an upcoming publication. Thank you for this very important additional information! Please keep us posted.